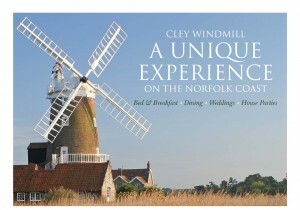 Here are some of the lovely things our guests have said about Cley Windmill. 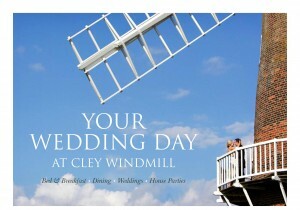 Gorgeous Windmill, impeccable service, glorious location. I recently arranged a family reunion, of sorts, in this windmill and stayed in the Barley Bin room. The service from a woman named Sarah, who managed our reservations for rooms and dinner was personal and prompt, professional and kind. The place is lovely and we enjoyed the main fireplace room after a very fine dinner together. This is a very special place. I thought it was extraordinary and recommend it with enthusiasm. 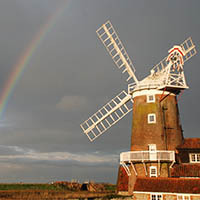 Bird watchers nationwide know Cley Windmill as a landmark. Our ambition was to stay in the mill and we jumped at the opportunity when it arose. Since then we’ve been once or twice a year and LOVE IT! Sheer luxury in romantic, natural surroundings – the sound of the wind through the reeds and geese flying over; the smell of bacon and the taste of good local produce; a warm room full of character; a comfortable bed; friendly, helpful staff… What more could one wish for? We were unbelievably happy with our day yesterday, it was perfect and totally surpassed our expectations. The Wedding itself was just as we wanted, intimate and friendly, perfect. Refreshments were lovely. Windmill itself FABULOUS. Evening also Fabulous. And thank you so much to Simon the chef for spoiling me on my special day, it was so good of him to humour me and the meal was gorgeous. Your staff are very, very nice. All in all, aside from the sun not being around, but that was partially my fault, our very special day was one we will always tell tales of and hold fond memories close. I felt that I must write to you to let you know what a superb time we had at our daughter’s wedding last Saturday. The whole occasion was handled so well by all those from Cley Windmill. We really appreciated all the small touches and the huge flexibility that everyone provided. The way that everyone picked up on the tone and ambiance and used their instincts to ensure success was of the highest quality and contributed in no small measure to a very special day. 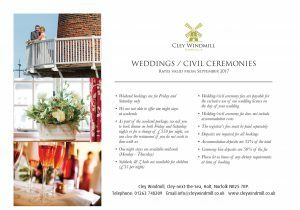 Cley Windmill is not just a wonderful building, the people make it a very special venue. Everyone was great from top to bottom: the chef couldn’t do enough for us; the room was immaculate; the waitress service was some of the best I have ever experienced – couldn’t do enough for us; the lovely ladies in the shop who welcomed us were so caring and warm; you gave us perfect service, perfect food, in a perfect location. We had a wonderful time. A big ‘Thank You’ to you and your staff for the welcome you gave us for our stay …also for the generosity you showed for our Golden Wedding Celebrations. 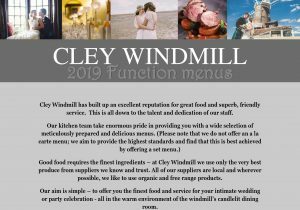 The night in the windmill, the wonderful food and the lovely people we met all made the occasions one we will never forget. Tina and I wanted to thank you and all the staff for our recent wedding and stay at Cley Windmill. From the time of arriving, up until leaving, you and your staff made us feel totally comfortable and welcome. The location to get married was better than we could have ever imagined, the accommodation was fantastic and the food was absolutely out of this world. Our wedding day was just perfect and there is nothing we would have changed. Please pass on our thanks to the rest of the staff for making our visit a time we will never forget. We will absolutely be returning. Many thanks for organising this splendid event (Birdwatching Event). It was absolutely first class and I hope you will repeat it – perhaps in the spring to see the return of the summer visitors. Andy could no doubt advise on the best time. Every aspect was extremely well done: the ambience of the mill and its location, the catering, the speakers, the excursions, the size of the group and its composition (in part this was a happy accident; although in my experience a group assembled to indulge a common avocation is usually compatible). Once again, congratulations on a successful and enjoyable event. I can’t begin to tell you what an amazing time we all had last weekend at what must be one of the most magical, accommodating and friendly destinations we have ever stayed at. The feedback we have had from everyone was without doubt a great tribute to you all and we were thrilled with everything you provided us with over the weekend. 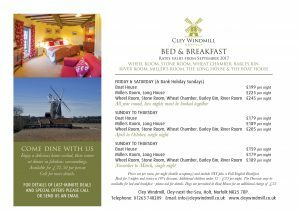 From the booking of the Windmill last October, to the organising of menus and rooms and the resulting weekend away, your attention to detail was second to none. On our arrival, Simon greeted us all personally, showing everyone to their fabulous rooms and making us all very welcome. The lounge made a great focal point for our get-togethers and was witness to much singing, games and revelry. The meals both at breakfast and in the evening were truly wonderful and the staff were a credit to you. The girls who looked after us in the evenings were really lovely and friendly and helped make the weekend the special occasion it was. The only problem now is that I am under pressure from everyone to do it all again. So be warned, we may be back. So a great big thank you to you all for allowing us to relax and enjoy the beauty of Cley Windmill. Ian and I have just come back from our honeymoon and just wanted to take the time to send you a really big thank you for looking after us all so well during our weekend with you earlier this month. Everyone at the windmill made us feel so welcome and really made our dream wedding a reality. We can’t express over email just how happy we were with everything, it was just perfect. The windmill is a perfect location but it is really made special by the people. The food was amazing too, just as we like it! All of our family and friends had nothing but lovely comments about the weekend. Also, the run up to the weekend was fantastic, you made us feel really comfortable about everything and nothing felt like too much trouble. We felt as though we were in safe hands. If you ever wanted any kind of testimonial for any reason we would be more than happy to send anything through to you (or feel free to use anything in this email!). We were also really pleased with Rita at passion of flowers, who we only used based on your recommendation, so thank you again. Brian Egan was our photographer and we have just received the link of the images he took that afternoon and they are wonderful. What was also great about Brian was how comfortable he made everyone feel too. We know he is based in Cley and becasue of that he was happy to charge us for only a couple of hours of his time, something many other photographers were not open to. If you have anyone looking for a similar limited coverage, or anything else, he really is a great recommendation. Thanks again, and hopefully we’ll see you again in the not too distant future.